Recorded in the spellings of Albarez, Alvares, Alvares, Alvar, Alvaro, Alvarado, and Alves (Spanish and Portugese), Alves, Alvis and Allvis (England) , this is believed to be a surname of 5th century Germanic and Anglo-Saxon origins. It is believed to originate from the compound 'all-wer' meaning 'The true people' or similar. After the fall of the Roman Empire, German tribes known as the Goths or Vizigoths swept down from Eastern Germany into the Spanish Peninsula. This had been a province of Rome since the 1st century a.d., but the Goths conquered it in months. They have left behind in Spain many reminders, not the least being the prominent surnames of that country. In effect the Anglo-Saxons did the same in England at much the same time. Examples of the surname recording include in Spain Barona Josepe Alvarez, at Valladolid, on March 30th 1594, and Juan Alvares, who married Maria Rodriguez at San Diego, California, on November 11th 1781. 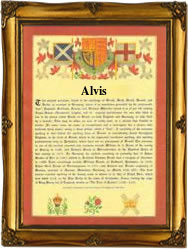 In England Thomas Allvis was a christening witness at St Mary Whitechapel, in the city of London, on January 26th 1661, although at the same church in 1659, the same Thomas is now called Alvis. On March 1st 1764, another Thomas, this time called Alves, is recorded at Endell Street Lying in hospital, Holborn, also city of London. The first recorded spelling of the family name is shown to be that of Juan Braba Albarez, which was dated March 15th 1548, at Nuestra Snora de la Antigua, Spain, during the reign of King Charles 1st of Spain and Emperor of Mexico, 1519 - 1556. Surnames became necessary when governments introduced personal taxation. In England this was known as Poll Tax. Throughout the centuries, surnames in every country have continued to "develop" often leading to astonishing variants of the original spelling.